In the 1980s, Iess helped pioneer a radio instrument for Cassini that delivered an exceptionally clear signal because it worked in the Ka band, which is relatively free of noise from interplanetary plasma. By monitoring fluctuations in the signal, the team planned to search for gravitational waves from the cosmos and test general relativity during the spacecraft’s journey to Saturn, which began in 1997. Iess’s group put a similar device on Juno, which launched in 2011, but this time the aim was to study Jupiter’s interior. Juno skims close to Jupiter’s surface every 53 days, and with each pass hidden influences inside the planet exert a minute pull on the spacecraft, resulting in tiny Doppler shifts in its radio signals. Initially, Iess and his team thought measuring those shifts wouldn’t be feasible at Saturn because of the gravitational influence of its rings. But that obstacle disappeared earlier this decade, after the Cassini team decided to end the mission by sending the craft on a series of orbits, dubbed the Grand Finale, that dipped below the rings and eliminated their effects. As a result, Iess and colleagues could use radio fluctuations to map the shape of gravity fields at both planets, allowing them to infer the density and movements of material deep inside. One goal was to probe the roots of the powerful winds that whip clouds on the gas giants into distinct horizontal bands. Scientists assumed the winds would either be shallow, like winds on Earth, or very deep, penetrating tens of thousands of kilometers into the planets, where extreme pressure is expected to rip the electrons from hydrogen, turning it into a metallike conductor. The results for Jupiter were a puzzle: The 500-kilometer-per-hour winds aren’t shallow, but they reach just 3000 kilometers into the planet, some 4% of its radius. Saturn then delivered a different mystery: Despite its smaller volume, its surface winds, which top out at 1800 kilometers per hour, go three times deeper, to at least 9000 kilometers. “Everybody was caught by surprise,” Iess says. Scientists think the explanation for both findings lies in the planets’ deep magnetic fields. At pressures of about 100,000 times that of Earth’s atmosphere—well short of those that create metallic hydrogen—hydrogen partially ionizes, turning it into a semiconductor. That allows the magnetic field to control the movement of the material, preventing it from crossing the field lines. “The magnetic field freezes the flow,” and the planet becomes rigid, says Yohai Kaspi, a planetary scientist at the Weizmann Institute of Science in Rehovot, Israel, who worked with Iess. Jupiter has three times Saturn’s mass, which causes a far more rapid increase in atmospheric pressure—about three times faster. “It’s basically the same result,” says Kaspi, but the rigidity sets in at a shallower depth. The Juno and Cassini data yield only faint clues about greater depths. Scientists once believed the gas giants formed much like Earth, building up a rocky core before vacuuming gas from the protoplanetary disc. Such a stately process would have likely led to distinct layers, including a discrete core enriched in heavier elements. But Juno’s measurements, interpreted through models, suggested Jupiter’s core has only a fuzzy boundary, its heavy elements tapering off for up to half its radius. This suggests that rather than forming a rocky core and then adding gas, Jupiter might have taken shape from vaporized rock and gas right from the start, says Nadine Nettelmann, a planetary scientist at the University of Rostock in Germany. Because Cassini’s mission ended with the Grand Finale, which culminated with the probe’s destruction in Saturn’s atmosphere, “There’s not going to be a better measurement anytime soon,” says Chris Mankovich, a planetary scientist at the University of California, Santa Cruz. But although the rings complicated the gravity measurements, they also offer an opportunity. For some unknown reason—perhaps its winds, perhaps the pull of its many moons—Saturn vibrates. The gravitational influence of those oscillations minutely warps the shape of its rings into a pattern like the spiraling arms of a galaxy. The result is a visible record of the vibrations, like the trace on a seismograph, which scientists can decipher to plumb the planet. Mankovich says it’s clear that some of these vibrations reach the deep interior, and he has already used “ring seismology” to estimate how fast Saturn’s interior rotates. Cassini’s last gift may be to show how fortunate scientists are to have the rings as probes. Data from the spacecraft’s final orbits enabled Iess’s team to show the rings are low in mass, which means they must be young, as little as 10 million years old—otherwise, encroaching interplanetary soot would have darkened them. They continue to rain material onto Saturn, the Cassini team has found, which could one day lead to their demise. But for now they stand brilliant against the gas giant, with more stories to tell. When NASA’s Cassini spacecraft plunges into the atmosphere of Saturn on Sept. 15, ending its 20 years of exploration, astronomers will observe the giant planet from Earth, giving context to Cassini’s final measurements. “The whole time Cassini is descending, we’ll be on the ground, taking data and learning about conditions on Saturn,” said Don Jennings, a senior scientist at NASA’s Goddard Space Flight Center in Greenbelt, Maryland, and a co-investigator for a Cassini instrument called the Composite Infrared Spectrometer. This farewell is fitting for a mission that has been supported by similar observations throughout its lifetime. NASA’s Infrared Telescope Facility, or IRTF, and the W. M. Keck Observatory, in which NASA is a partner, have provided crucial contributions from the summit of Maunakea in Hawaii. Other U.S. and international telescopes also have investigated the Saturn system, complementing and enhancing the mission. “IRTF and other facilities have provided direct support to the Cassini–Huygens mission and made it possible to link that data to decades’ worth of earlier and ongoing ground-based studies,” said IRTF director John Rayner. Ground-based observations of Titan, the giant planet’s largest moon, helped with preparations for the Huygens probe mission early in Cassini’s exploration of the Saturn system. The probe was released after Cassini entered Saturn orbit and descended through Titan’s thick atmosphere to land on the surface. A coordinated ground campaign was organized to study Titan’s atmosphere and surface, to measure the wind speed and direction, to look at atmospheric chemistry and to provide global imaging. Eight facilities worldwide participated, observing before, during and after the Huygens probe mission, led by the European Space Agency. These included the Keck Observatory, which captured high-resolution images of the atmospheric weather patterns on Titan, and the IRTF, which helped determine the direction of Titan’s winds. IRTF continues to be used for long-term studies of Saturn and Titan and their atmospheres, and to investigate Saturn’s moons, extending and complementing Cassini findings. The facility’s recently installed high-resolution infrared instrument, called iSHELL, will be deployed for ongoing studies of the aftermath of a massive storm that broke out in Saturn’s northern hemisphere in 2010. With its very high spectral resolution, iSHELL has been optimized for the study of planetary atmospheres. Cassini also has received plenty of aloha from the Keck Observatory, which has provided many sharp images and spectra of Saturn’s most famous feature – its rings. These studies are made possible by the high spatial resolution of Keck’s large aperture combined with a state-of-the-art adaptive optics system to correct for distortions caused by Earth’s atmosphere. During the summer of 2017, the Cassini team used Keck Observatory to take near-infrared spectroscopic data of the regions near Saturn’s equator, just as Cassini was diving between Saturn and its rings during its final orbits. The team also took Keck data of the polar magnetic fields to better understand the planet’s auroras, which are similar to Earth’s northern and southern lights. The Keck Observatory data will be used to verify Cassini’s data to provide a sort of “ground-truth” calibration of some of the on-board instruments of the orbiter. NASA’s Cassini spacecraft has delivered a glorious view of Saturn, taken while the spacecraft was in Saturn’s shadow. The cameras were turned toward Saturn and the sun so that the planet and rings are backlit. (The sun is behind the planet, which is shielding the cameras from direct sunlight.) In addition to the visual splendor, this special, very-high-phase viewing geometry lets scientists study ring and atmosphere phenomena not easily seen at a lower phase. Since images like this can only be taken while the sun is behind the planet, this beautiful view is all the more precious for its rarity. The last time Cassini captured a view like this was in Sept. 2006, when it captured a mosaic processed to look like natural color, entitled “In Saturn’s Shadow” (see PIA08329.) In that mosaic, planet Earth put in a special appearance, making “In Saturn’s Shadow” one of the most popular Cassini images to date. Earth does not appear in this mosaic as it is hidden behind the planet. Many lessons learned during Cassini’s mission are being applied to planning NASA’s Europa Clipper mission, planned for launch in the 2020s. Europa Clipper will fly by the icy ocean moon dozens of times to investigate its potential habitability, using an orbital tour design derived from the way Cassini has explored Saturn. The Europa Clipper mission will orbit the giant planet — Jupiter in this case — using gravitational assists from its large moons to maneuver the spacecraft into repeated close encounters with Europa. This is similar to the way Cassini’s tour designers used the gravity of Saturn’s moon Titan to continually shape their spacecraft’s course. The grand finale of NASA’s epic 20-year mission to the ringed planet will be overseen from a deep space centre near Canberra. A photo essay by Jonny Weeks. On 15 September 2017 at about 10pm AEST, NASA’s Cassini spacecraft will plunge deep into the hostile atmosphere of Saturn on a historic but suicidal course. It’s the grand finale of a 20-year mission which has revolutionised our understanding of the solar system and sent home more than a quarter of a million stunning images of Saturn and its moons. Cassini’s instruments will be running to the last, capturing every possible byte of data from its closest encounter with the ringed planet before it ultimately evaporates. 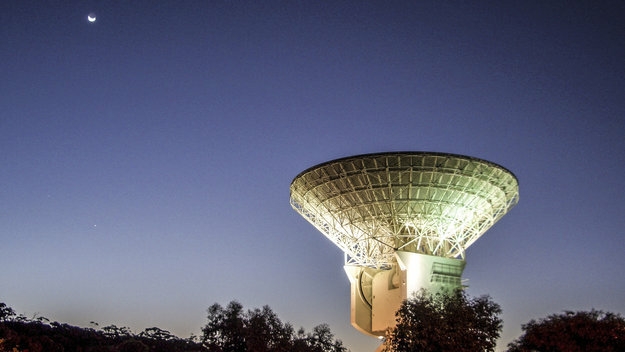 Some 1.2bn km away, in a valley just outside Canberra, Glen Nagle and his colleagues will be listening intently to what he calls the “whispers” from deep space. “I’m going to be here for 24 hours and I won’t be sleeping,” he says enthusiastically. Nagle (pictured above) works at the the Canberra Deep Space Communication Complex, aka Tidbinbilla tracking station, home to four antennas which help track and command the many spacecraft in our solar system. 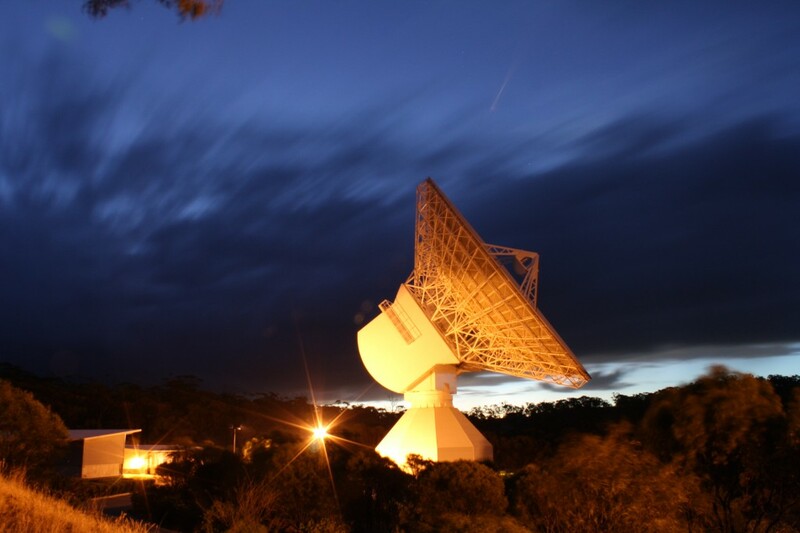 Run by CSIRO, Australia’s national science agency, but funded by NASA, Tidbinbilla is one of just three stations in NASA’s Deep Space Network (the others are in California and Madrid) and it is here that Cassini’s final radio signals will be received and relayed to a global audience. “We’re going to be responsible for capturing Cassini’s last breath of data,” Nagle says. “It’ll be a bittersweet moment. Opened in 1965, Tidbinbilla is a serene station enveloped by national parks. It’s a place where the low hum of the moving antennas and the occasional paging announcements are the only sounds that punctuate the silence. The dishes look surprisingly small from a distance, dwarfed by nature itself, but up close their scale is imposing. The largest is 70m in diameter and 109m across its curvature – “you could throw a football field into it,” Nagle says – and weighs about 4,000 tonnes. They are almost millimetre-perfect parabolic surfaces. Each dish acts as both a gigantic ear and a gigantic loudspeaker, telling the spacecrafts how to behave, ensuring their health and collecting their data. The dishes operate night and day, whether or not the skies are clear to the naked eye. “At the present time we, Earth, have about 30 missions in the solar system, so about 40 individual spacecraft,” Nagle says. “We communicate with them using radio waves – the invisible part of the electromagnetic spectrum. The furthest of them, Voyager 1, is so far from Earth that it seems a minor miracle its signal can be heard at all. For Nagle, a self-confessed space buff since childhood who is now the outreach and administration lead at Tidbinbilla, it’s a thrilling thought. “Right now Voyager 1 is roughly 20.7bn km away and moving further away by about 1.4million km every day,” he says. “That’s about four and a quarter times further away than Pluto. So it’s way out there. It takes over 30 hours to get a signal there and back. “To give you some idea of what that signal is like now: Voyager transmits at around 19 watts, about half the power it’s taking to run the lightbulb in your fridge. So imagine already trying to see half your fridge light from four and quarter times as far away as Pluto – you’re not going to see it. “And it gets even smaller because as that signal travels across that 20bn km of space it spreads out, it becomes thinner and more diffuse. Michael Murray (right) fixing the gears on DSS35. Up high on dish number DSS35, there’s a minor problem which needs to be fixed. The ball gears are not meeting correctly and the dish’s ability to slowly pivot – as it must do to track the craft while the Earth rotates – is being compromised. As with everything in space exploration, precision counts. And yet, oddly, just a few metres away there’s a kink in the safety rail where a section has been cut away and awkwardly repositioned. John Howell, survey electronics technician, pointing out the mistake in a handrail. 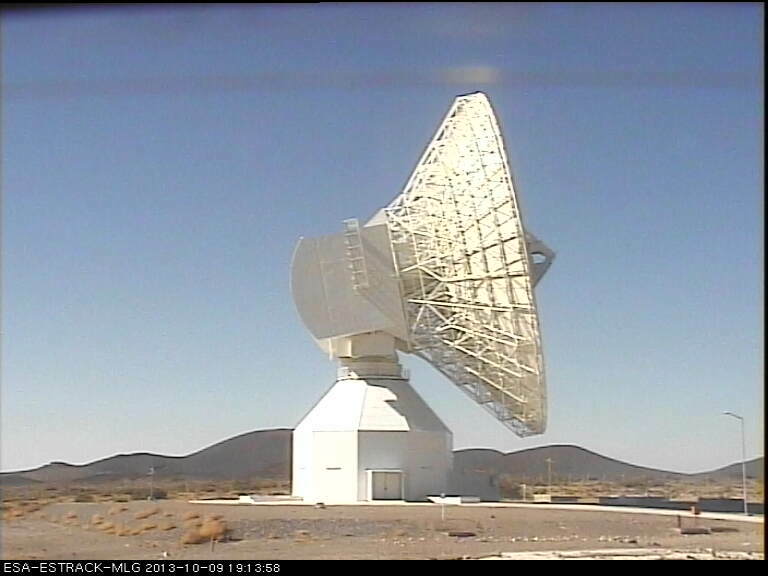 It had to be repositioned when the engineers realised the dish could not rotate fully. 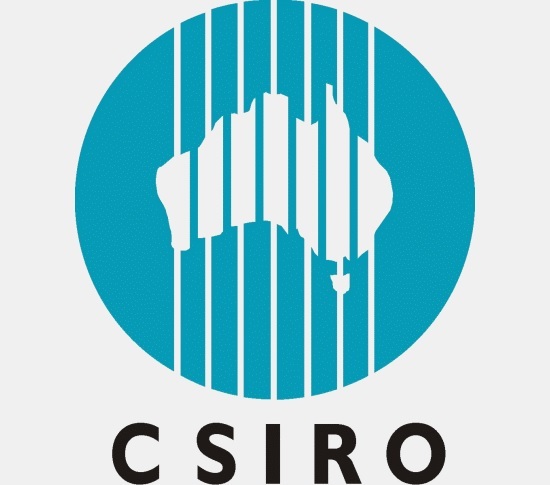 Howell has been employed at Tidbinbilla by CSIRO for the past 15 years – the same duration as Nagle – but, unlike his colleague, his knowledge of the science is more cursory. He adds: “But I am interested in the Voyager probes. It takes forever to get a signal to them and back at the speed of sound” – “light,” Nagle interrupts apologetically – “Oh sorry, the speed of light!” Howell continues. A view to the north of the station from DSS35. In the recently built control centre – a place Matthew Purdie, senior link controller, describes as “the heart of the station” – activity is decidedly slow. You might imagine a hive of scientists huddled around monitors awaiting fresh data but in fact there’s only one CSIRO scientist based at Tidbinbilla and his research role is detached from the day-to-day communications performed on behalf of NASA and the other space superpowers. NASA’s scientists are located at the Jet Propulsion Laboratory in the US. Purdie and his team of controllers are patiently monitoring banks of screens, waiting for the rare occasion when a command fails or for the more alarming news that a craft has become inoperable or gone missing. Occasionally they have to call the JPL to tell them their craft are sick. Matthew Purdie, senior link controller, in the control centre. Behind him, a box of on one of his screens turns orange. “Oh, that’s nothing to worry about,” he says assuredly. “That’s a ‘carrier out of lock’. It’s spacecraft 74. We lost the signal but it was an expected loss of signal because the craft occultated – it went behind Mars. Purdie knows plenty about Cassini, however, and has been on duty for some of its recent dives – the series of 22 daring orbits between Saturn and its rings which have given the craft a unique perspective on the planet and the surrounding bands of dust, rock and ice. Disappointingly, Purdie already knows his shift patterns will cause him to miss the finale next month. He’s tempted to come to work anyway. 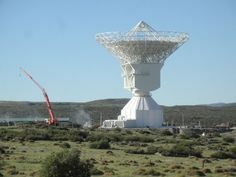 A close-up view of the largest dish on site showing the parabolic surface. The tall cone-like structure in the middle is the transmitter-receiver system. The cone is the height of a five-storey building. Australia’s involvement in space exploration is six decades old and even though Nagle thinks “Australia doesn’t see itself as a space-faring nation” it has played a critical role in some of the most inspiring moments in the history of humankind. “The dish out the front is the one from Honeysuckle Creek that received and relayed to the whole world the first pictures of Neil Armstrong walking on the moon in 1969,” Nagle explains. He must have regaled people with the full story a thousand times or more, yet he makes it sound anything but tiresome. “NASA’s original intention was to use their dish in California to transmit the pictures to the world and show America winning the space race,” he says. “When Neil came out of the spacecraft the first thing he needed to do was switch on a camera which was mounted upside down so that he could later pick it up with his big, gloved hand. NASA were going to flip the picture but the video technician called in sick that day and his backup forgot. Greg Boyd, senior network administrator, at his desk at Canberra Deep Space Communication Complex. That enduring sense of wonder is shared by Greg Boyd, the senior network administrator at Tidbinbilla. “I love the science,” he says. “When I first started I was into everything. We used to have these things called twixes, well before we had emails. They were advisories about what was happening and I’d be reading all this groovy stuff that’s going on. The night’s sky over Tidbinbilla showing the Milky Way. As night falls over Tidbinbilla, low-lying clouds initially block the views overhead. A group of kangaroos gathers by the perimeter fence, intrigued by the faint, eerie noises emanating from the site. By 3am the clouds have finally dissipated and the vast, star-spangled sky is simply breathtaking. Somewhere out there, Cassini is looping the loop between Saturn and its rings. In its lifetime Cassini and its accompanying probe, Huygens, have revealed many of the secrets of the Saturnian system: how the particles that make up Saturn’s rings range in size from smaller than a grain of sand to as large as mountains; how Titan, one of the moons, has prebiotic chemistry as well as rain, rivers, lakes and seas; how icy plumes of water are spraying upwards from “tiger stripe” fractures on Enceladus, an otherwise frozen moon. It has also witnessed giant hurricanes at both of Saturn’s poles and captured the first complete view of the north polar hexagon – not bad for a one megapixel camera. The finale should reveal yet more about the interior of the planet as the craft measures its gravity and magnetic field. The decision to hurl Cassini into Saturn’s deadly, gaseous atmosphere next month has been made through necessity and responsibility. The craft has run out of fuel and contains a nuclear battery; NASA’s scientists fear it might contaminate one of the surrounding moons should it crash into them. “We have to dispose of the spacecraft safely,” says deputy project scientist Scott Edgington, who’s based in California, “because Titan and Enceladus have been shown to be places where there are conditions for habitability, conditions that we think are appropriate for life. A ‘stacked’ star-trail photograph. Created from 162 individual exposures and made over 81 minutes, it shows the progression of the stars around the south celestial pole. Ten-year-old Scout Miller is proof. She’s at the centre with her family, and talk of the discoveries made by Cassini and Juno – NASA’s mission to Jupiter which delivered a tranche of close-up images of the planet’s red spot – has made her wonder what else might be out there. Future missions to Saturn and its moons may yet reveal some answers, but for Cassini the deadly denouement is imminent. The rear of DSS43 as the sun rises at the start of a new day of tracking. 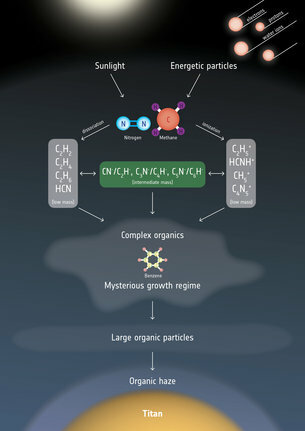 In a new study published in The Astrophysical Journal Letters, scientists identified some of the negatively charged species as what are known as ‘carbon chain anions’. These linear molecules are understood to be building blocks towards more complex molecules, and may have acted as the basis for the earliest forms of life on Earth. Cassini’s 13-year odyssey in the Saturnian system will soon draw to a close, but future missions, such as the international James Webb Space Telescope and ESA’s Plato exoplanet mission are being equipped to look for this process not only in our own Solar System but elsewhere. Advanced ground-based facilities such as ALMA could also enable follow-up observations of this process at work in Titan’s atmosphere, from Earth. Ring Crossing: In this still from the short film Cassini’s Grand Finale, the spacecraft is shown diving between Saturn and the planet’s innermost ring. Credit: NASA/JPL-Caltech. A pair of photos of ESA’s Malargue station that perfectly illustrate how the Agency’s tracking efforts progressed last night. 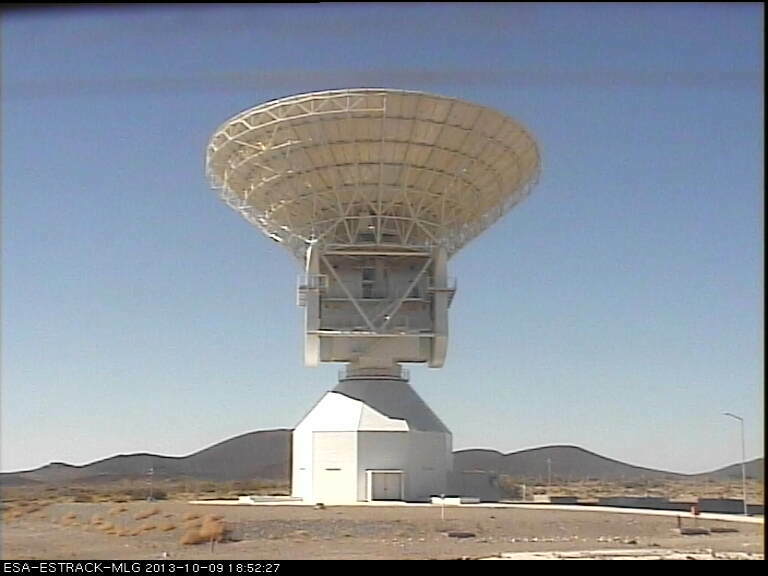 At left, the huge 35m dish antenna is pointing more or less straight up as Juno approached Earth high above Argentina. Of course, Earth rotates, so the antenna had to be continuously tracked down and rotated. At right, finally, as Juno dipped out of line-of-sight below the horizon, the station lost contact with the spacecraft with the antenna pointed low toward the East. The craft continued en route to make closest approach above S. Africa a few minutes after the right-hand image was taken. After nearly 13 years in orbit around Saturn, the international Cassini–Huygens mission is about to begin its final chapter: the spacecraft will perform a series of daring dives between the planet and its rings, leading to a dramatic final plunge into Saturn’s atmosphere on 15 September. On 22 April, Cassini successfully executed its 127th and final close flyby of Saturn’s largest moon, Titan. The manoeuvre put the spacecraft onto its ’grand finale’ trajectory: a series of 22 orbits, each lasting about a week, drawing closer to Saturn and passing between the planet’s innermost rings and its outer atmosphere. The first crossing of the ring plane will occur on 26 April. Dramatic plumes, both large and small, spray water ice out from many locations along the ‘tiger stripes’ near the south pole of Saturn’s moon Enceladus. The tiger stripes are fissures that spray icy particles, water vapour and organic compounds. More than 30 individual jets of different sizes can be seen in this image, which is a mosaic created from two high-resolution images captured when Cassini flew past Enceladus and through the jets on 21 November 2009. This view was obtained at a distance of about 14 000 km from Enceladus. Another of Cassini’s breakthroughs was the detection of a towering plume of water vapour and organic material spraying into space from warm fractures near the south pole of Saturn’s icy moon, Enceladus. These salt-rich jets indicate that an underground sea of liquid water is lurking only a few kilometres below the moon’s icy surface, as confirmed by gravity and rotation measurements. A recent analysis of data collected during flybys of Enceladus with the Cassini Ion Neutral Mass Spectrometer also revealed hydrogen gas in the plume, suggesting that rock might be reacting with warm water on the seafloor of the moon’s subsurface ocean. This hydrothermal activity could provide a chemical energy source for life, enabling non-photosynthetic biological processes similar to the ones found near the hydrothermal vents on the Earth’s ocean floor and pointing to the potential habitability of Enceladus’ underground ocean. Illustration of the trajectory of the Cassini mission between November 2016 and September 2017. Following a series of ring-grazing orbits that started in November 2016 (grey), the mission executed its 127th and final close flyby of Saturn’s largest moon, Titan, on 22 April 2017. The orbit of Titan is shown in yellow. 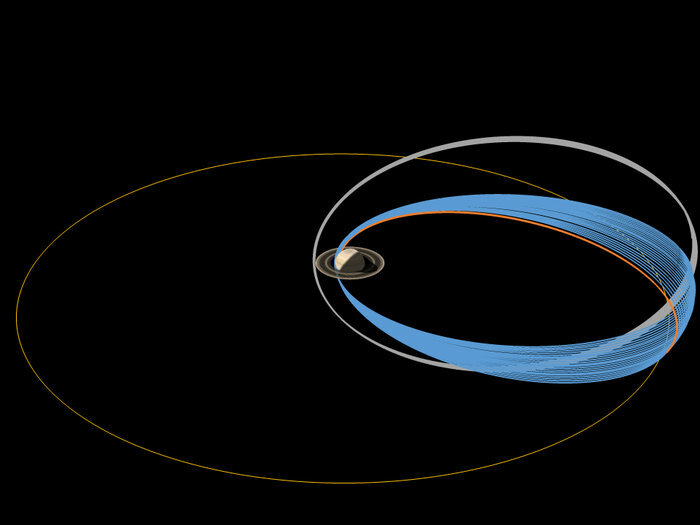 This manoeuvre put the spacecraft onto its ‘grand finale’ trajectory: a series of 22 orbits, each lasting about a week, drawing closer to Saturn and passing between the planet’s innermost rings and its outer atmosphere (blue). Eventually, Cassini will plunge and burn up into Saturn’s atmosphere on 15 September 2017 (orange), satisfying planetary protection requirements to avoid possible contamination of any moons of Saturn that could have conditions suitable for life. These close orbits will be inclined 63 degrees with respect to Saturn’s equator and will provide the highest resolution observations ever achieved of the inner rings and the planet’s clouds. The orbits will also give the chance to examine in situ the material in the rings and plasma environment of Saturn. With its radio science investigation, Cassini will measure Saturn’s gravitational field as close as 3000 km from Saturn’s upper cloud layers, greatly improving the current models of the planet’s internal structure and winds in its atmosphere. Scientists expect the new data will also allow them to disentangle the gravity of the planet from the tiny pull exerted on the spacecraft by the rings, estimating the total mass of the rings to unprecedented accuracy. ESA ground stations in Argentina and Australia will help receive Cassini’s radio science data, providing a series of 22 tracking passes during the grand finale. The New Norcia station, DSA 1 (Deep Space Antenna 1), hosts a 35-metre deep-space antenna with transmission and reception in both S- and X-band and is located 140 kilometres north of Perth, Western Australia, close to the town of New Norcia. DSA-1 is designed for communicating with deep-space missions and provides support to spacecraft such as Mars Express, Rosetta and Gaia for routine operations. The grand finale orbits will also probe the planet’s magnetic field at similarly close distances. Previous observations have shown that the magnetic field is weaker than expected, with the magnetic axis surprisingly well aligned with the planet’s rotation. New data to be collected by the Cassini magnetometer will provide insights to understand why this is so and where the sources of magnetic field are located, or whether something in Saturn’s atmosphere has been obscuring the true magnetic field from Cassini until now. Cassini between Saturn and the rings. No image credit. 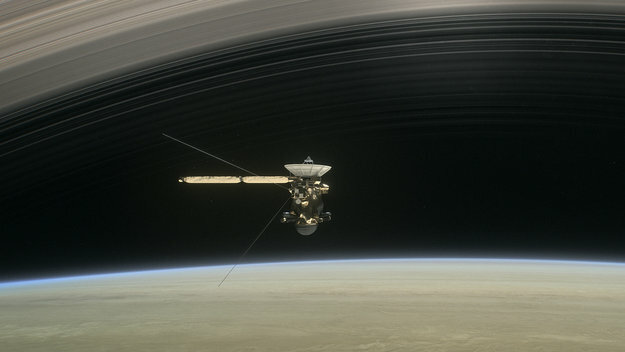 While crossing the ring plane, Cassini’s Cosmic Dust Analyzer will directly sample the composition of dust particles from different parts of the ring system, whereas the Ion Neutral Mass Spectrometer will sniff the upper atmosphere layers of Saturn to analyse molecules escaping from the atmosphere as well as water-based molecules that originate from the rings. NASA’s Cassini spacecraft and ESA’s Huygens probe expanded our understanding of the kinds of worlds where life might exist. With discoveries at Saturn’s moons Enceladus and Titan, Cassini and Huygens made exploring “ocean worlds” a major focus of planetary science. Insights from the mission also help us look for potentially habitable planets — and moons — beyond our solar system. Life as we know it is thought to be possible in stable environments that offer liquid water, essential chemical elements, and a source of energy (from sunlight or chemical reactions). Before Cassini launched in 1997, it wasn’t clear that any place in the icy outer solar system (that is, beyond Mars) might have this mix of ingredients. By the next year, NASA’s Galileo mission revealed that Jupiter’s moon Europa likely has a global ocean that could be habitable. Since its 2004 arrival at Saturn, Cassini has shown that Europa isn’t an oddball: Potentially habitable ocean worlds exist even in the Saturn system — 10 times farther from the sun than Earth. When the Cassini mission started, scientists presumed Enceladus was too small to generate and hold onto the heat required to maintain subsurface reservoirs of liquid water. Cassini’s discovery of intense geologic activity near the moon’s unexpectedly warm south pole — complete with towering jets of icy spray — sent shockwaves through the space science community. 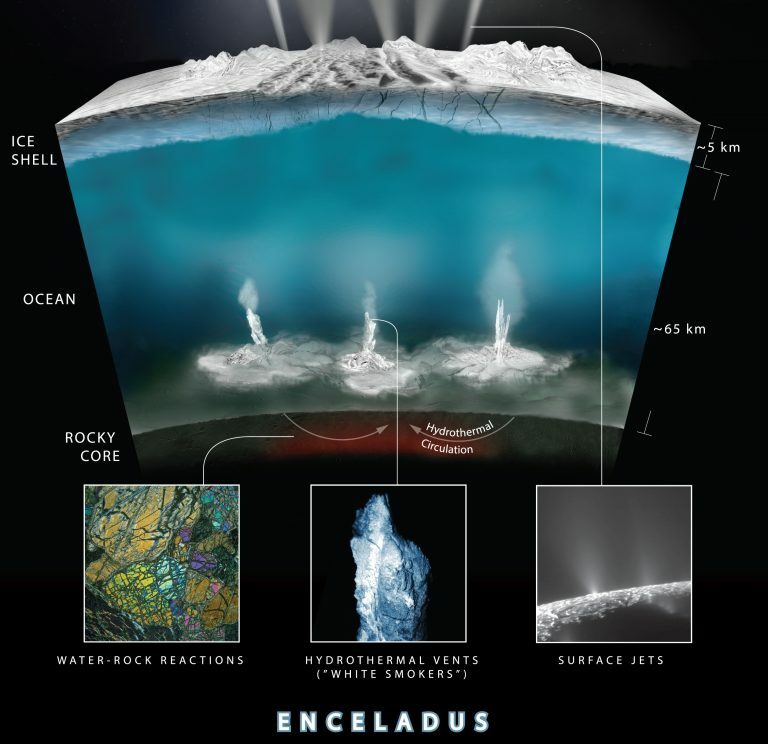 After over a decade of investigation, the mission eventually determined that Enceladus hosts a global liquid water ocean, with salts and simple organic molecules, and likely even hydrothermal vents on its seafloor. Thanks to Cassini, Enceladus is now one of the most promising places in our solar system to search for present-day life beyond Earth. Saturn’s largest moon, Titan, offered tantalizing hints that it, too, could help us understand whether life could have evolved elsewhere. Cassini and ESA’s Huygens probe (which landed on Titan’s surface) found clear evidence for a global ocean of water beneath Titan’s thick, icy crust and an atmosphere teeming with prebiotic chemicals. Based on modeling studies, some researchers think Titan, too, may have hydrothermal chemistry in its ocean that could provide energy for life. On its frigid surface, which hosts vast seas of liquid hydrocarbons, scientists wonder, could Titan be home to exotic forms of life “as we don’t know it”? At Saturn’s largest moon, Titan, Cassini and Huygens showed us one of the most Earth-like worlds we’ve ever encountered, with weather, climate and geology that provide new ways to understand our home planet. Titan is 10 times farther from the sun than Earth and much colder, but Cassini showed it to be the only other place in our solar system with stable liquid on its surface and a kind of “hydrological” cycle involving methane rather than water. Flowing liquid hydrocarbons at Titan make for eerily Earthlike landscapes — they carve branching channels and steep canyons into rock-hard ice; they settle into lakes and seas with gently sloping shorelines and sheltered bays; they tumble water-ice “rocks” into rounded pebble shapes like those in earthly rivers. Titan’s landscape also shares other similarities with Earth. Large, arid swaths of dunes gird the moon’s equatorial regions. Composed of organic materials that settle out of Titan’s thick, hazy atmosphere, these dunelands are sculpted by winds in ways similar to dunes in places like Namibia and the Sahara. Scientists have also spotted volcano-like mounds that, if indeed volcanic in nature, would erupt slushy lavas made of water rather than molten rock. From its perch in space, Cassini has been watching Titan’s climate cycle play out over the years, with seasonal changes bringing bright, feathery methane rain clouds that dump precipitation on the landscape. Huygens saw clear evidence of a landscape that experiences intermittent but heavy floods, not unlike places in the American desert southwest. Cassini is, in a sense, a time machine. It has given us a portal to see the physical processes that likely shaped the development of our solar system, as well as planetary systems around other stars. Cassini has provided a brief glimpse into deep time in the Saturn system. The rings, for example, are a natural laboratory for processes that form planets — a mini solar system, if you will. They show us how objects clump together and break apart. And in the ripples we can read the history of impacts into the rings. We also see “propeller” features that obey the same physical processes that form planets. Moons in the Saturn system are also time capsules preserving histories of bombardment and other forces at play over time. At Titan, in particular, we have access to the kinds of complex carbon chemistry that might have taken place on Earth in its “prebiotic” days. During the Cassini mission’s finale, data about the planet’s interior and the mass of the rings will provide a powerful insights about their formation and evolution. While other missions flew past Saturn or trained telescopes periodically from afar, Cassini has had a front-row seat for approximately 13 years — nearly half a Saturn year (northern winter to the start of northern summer) — to epic changes unfolding before its very eyes. Over a longer span of years, the color of Saturn’s northern hemisphere shifted as the ring shadows retreated southward — changing from the surprisingly bluish tones seen upon arrival to the hazy, golden hues most observers are familiar with. On Titan, Cassini witnessed a vortex filled with complex organic chemicals forming over its south pole, and saw sunlight glinting off of the lakes in its northern hemisphere as the sun rose over them. The spacecraft’s patient eyes also were rewarded with new views of Saturn’s north pole as winter ended there and the sun rose once more. Cassini’s infrared sensors measured temperatures across the rings as the sun set on one side and rose on the other, revealing new details about the structure of ring particles. It used the onset of wintry darkness at the south pole of Enceladus to obtain an unambiguous reading of the amount of heat coming out of the moon’s interior. And it saw the mysterious ring features called spokes (wedge-shaped features in the rings that rotate along with the rings like the spokes in a wheel) appear and disappear — apparently a seasonal phenomenon. Planet-size Titan and diminutive Enceladus stood out in Cassini’s in-depth survey of Saturn’s moons. But the mission showed that every moon in the Saturn system is a unique character with its own mysteries, and many of Saturn’s satellites are related in surprising ways. For example, Cassini data enabled scientists to confirm earlier suspicions that Phoebe is likely an object from the outer solar system beyond Neptune, captured by Saturn’s gravity long ago. Phoebe also turns out to be key to the two-toned appearance of the moon Iapetus: As Phoebe sheds its dark dust, it coats the leading side of Iapetus and causes ice to heat up and migrate to the moon’s opposite side. Cassini also gave scientists a better understanding of why Hyperion looks like a giant sponge or wasp’s nest tumbling through space. Researchers determined that the moon’s density is so low that impacts tend to compress its surface rather than blasting it out, and the material that is launched into space tends to escape for good, thanks to Hyperion’s low gravity. Cassini found that Enceladus is not only active, but that its geologic activity is creating Saturn’s E ring and spray-painting the surfaces of several of the other moons with its highly reflective ice particles. The mission also followed up on a mystery from the early 1980s when NASA’s Voyager spacecraft flew by the Saturn system and saw bright wispy terrains on Dione. Cassini found that the features were in fact a vast network of canyons. Cassini also detected hints of a faint atmosphere that might have been outgassed from the moon’s interior. Although Cassini scientists are still working on determining the exact origin of Saturn’s main system of rings — and hope to collect data that will answer this question as its mission draws to a close — they have learned along the way that there are in fact, many ways to form rings around a planet. There is a diffuse ring that is created out of the bits of water ice jetted out by the moon Enceladus (the E ring). There are rings that were created because of the material thrown off when meteorites hit moons (such as the G ring and the two rings discovered by Cassini in images from 2006 — the Janus-Epimetheus ring and the Pallene ring). There are rings controlled by interactions with moons, like the F ring, which is regularly perturbed by Prometheus, and the narrow ringlets that share the Encke Gap with Pan. In addition to the rings’ origins, Cassini’s close-up examination has also revealed propeller-shaped features that mark the locations of hidden moonlets. The processes involved in the formation of such objects are thought to be similar to how planets form in disks around young stars. Cassini also helped explain Saturn’s “spokes,” first spotted during the Voyager flybys of the early 1980s. Cassini scientists figured out that they are made of tiny ice particles that are lifted above the surface of the rings by an electrostatic charge, the way a statically-charged balloon held over a person’s head will lift hairs. Their charge appears to be related to the angle of sunlight striking the rings — a seasonal effect. The changing angle of the sun also showed scientists an array of vertical structures in the rings, including fluffy peaks of material as high as the Rocky Mountains at the outer edges of the A and B rings. The vertical structures and the shadows they cast also revealed wavy patterns in the parts of the rings that resemble a miniature Milky Way, giving scientists insight into the way galaxies form. Some of Cassini’s best discoveries were serendipitous. What Cassini found at Saturn prompted scientists to rethink their understanding of the solar system. You can only get to know a planet so well with remote and sporadic observations. To truly understand the dynamics of a place as complicated and interesting as Saturn, you have to go there and stay to explore. 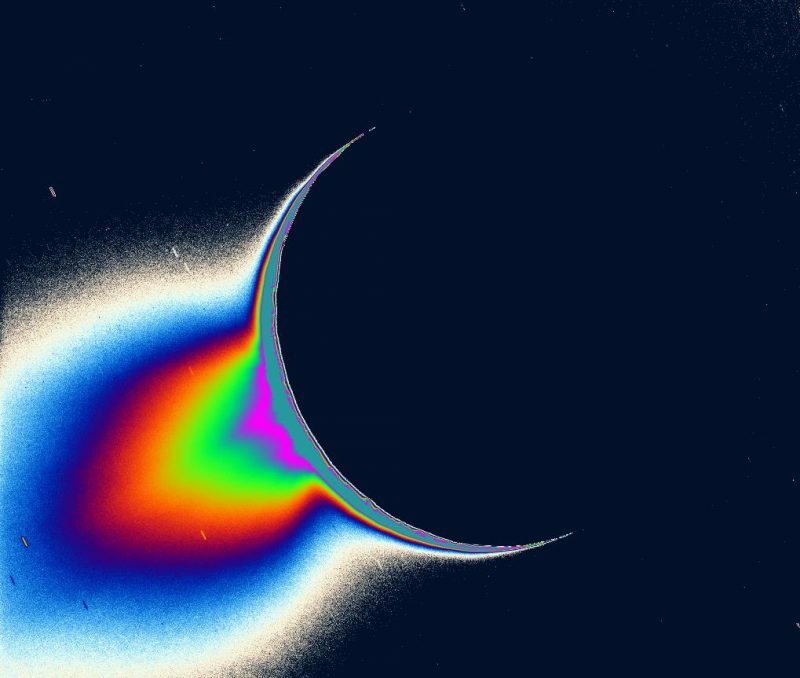 Towering jets of ice and water vapor pouring out of a moon as tiny as Enceladus were a huge surprise (explaining why Voyager flybys in the early 1980s saw that the moon had a young surface), as was the later finding that the moon has an ocean under its icy crust. Scientists also had not expected to find Saturn’s magnetosphere — the region around the planet strongly influenced by Saturn’s magnetic field — to be filled with an electrically excited gas, or plasma, of oxygen. It turned out this was another surprise from Enceladus, as the water vapor from its plume is broken apart by sunlight and the liberated oxygen spreads out through Saturn’s magnetic bubble. Cassini detected this oxygen on approach to Saturn, but its origin was perplexing at first. No one knew for sure what kind of environment ESA’s Huygens probe would find when it came to rest on Titan’s surface, so Huygens was built either to land on hard ground or float, if need be. Cassini later showed scientists that most of the moon’s lakes and seas were near the north pole, and most of the moon’s landscape was more like the Arizona desert. Cassini also observed a surprisingly rich variety of complex, organic chemicals forming in Titan’s atmosphere. Another unexpected finding — which endures as a mystery — is the irregularity of Saturn’s day (how long the planet takes to make one rotation on its axis). At Jupiter, a beacon-like burst of radio waves known as “kilometric radiation” beams out with clock-like regularity once a day. But Saturn’s kilometric radiation isn’t consistent. It’s somewhere between 10.6 and 10.8 hours. That might not seem like a big discrepancy, but for such a fundamental property as the planet’s rotation period, it’s frustratingly imprecise for scientists. They hope to settle the score by the time the mission ends by flying Cassini close enough to the planet to tease out the true answer from the magnetic field. 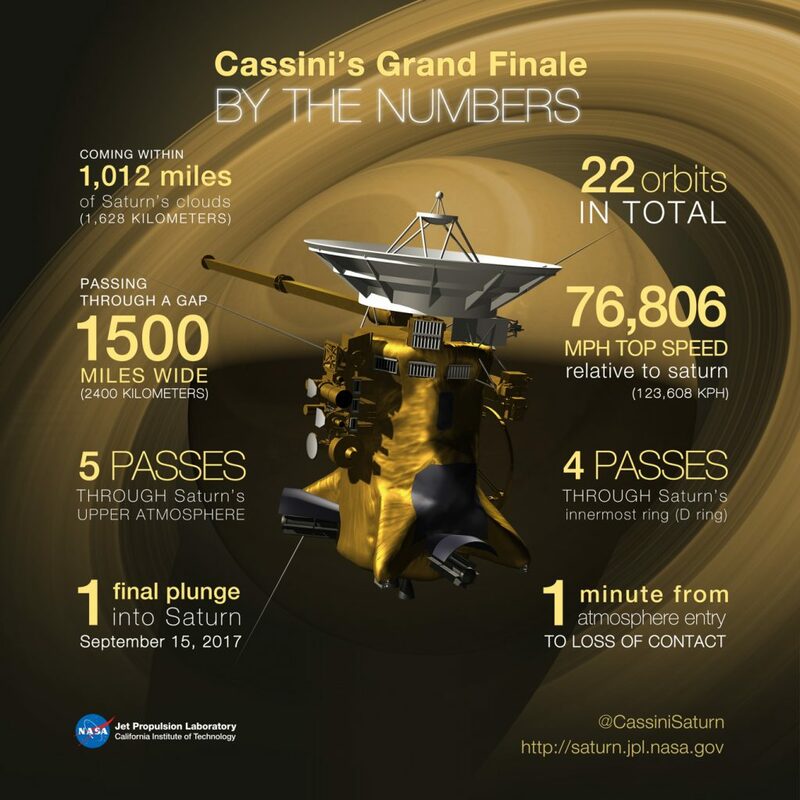 Cassini represents a staggering achievement of human and technical complexity, finding innovative ways to use the spacecraft and its instruments, and paving the way for future missions to explore our solar system. Cassini was able explore the entire Saturn system in a way inconceivable with conventional propulsion. Building on the techniques used by the Galileo mission to Jupiter, Cassini mission planners designed flybys of the moon Titan to utilize the moon’s gravity to navigate around the Saturn system and maximize the science return of the mission. Titan became, in a way, Cassini’s virtual “gas station” since the spacecraft couldn’t possibly have brought enough fuel for a tour this long and complex. Each of Cassini’s 127 targeted Titan flybys changed the spacecraft’s velocity (on average) by as much as the entire Saturn orbit insertion burn. The exquisite optimization techniques developed during Cassini will enable planning for future exploration that can use similar approachs. Chief among these opportunities is NASA’s planned mission to explore Jupiter’s moon Europa using multiple flybys, known as the Europa Clipper. Cassini has required an extremely complex schedule for determining which instrument’s observations can be made at any given moment. Cassini’s intricate observation sequences, often timed to fractions of a second, are frequently planned many months or years before they are executed by the spacecraft. The collaboration between multiple teams with often differing objectives has become an exemplary model for future missions. Over the course of almost 20 years in space, Cassini also showed that you can teach an old dog new tricks, as the mission team found new ways to use its instruments and engineering systems that their designers had not foreseen. These include using the radar instrument to plumb the depths of Titan’s seas; tasting the plume of Enceladus with instruments meant to sample Titan’s atmosphere; scanning the rings with a radar originally designed to bounce signals off of Titan’s surface; and having the Deep Space Network’s highly accurate frequency reference fill in for the radio science instrument’s lost ultra-stable onboard frequency reference. In a unique collaboration, the attitude control and navigation teams joined with the instrument teams to develop a consolidated model of Titan’s atmosphere. Cassini will finish its mission repurposing the instruments that sniffed Titan’s atmosphere and Enceladus’ plume once more, this time to sample the Saturn atmosphere itself. The mission has also had some rather surprising earthly benefits. A Cassini resource exchange, created prior to launch to help team members trade and effectively share power, mass, data rates and budget, has become a model for how to manage other types of international collaboration, including carbon trading. When Cassini plunges into Saturn’s atmosphere, it will have spent nearly every last drop of fuel it’s carrying, a fitting end to a spacecraft that pushed itself to the limit…and in many ways, beyond. Cassini revealed the beauty of Saturn, its rings and moons, inspiring our sense of wonder and enriching our sense of place in the cosmos. Earthlings have cast their gaze upward at Saturn since ancient times, but it was Cassini’s decade-plus odyssey in orbit there that revealed the true splendor of what is arguably the most photogenic planet in our solar system. The mission returned stunning views of complex, swirling features in Saturn’s atmosphere, draped by the graceful ring shadows that slowly shift with the seasons. The spacecraft also revealed the bewildering variety of Saturn’s moons and helped us see each one as a unique world in its own right. One has a noticeable ridge around its equator and a two-toned color pattern (Iapetus); one looks like the “Death Star” from Star Wars (Mimas); one looks like a sponge (Hyperion); another looks like a flying saucer (Atlas); another looks like a potato (Prometheus); another looks like a ravioli (Pan). Cassini has shown us icy ringscapes that are at once magnificent in their sheer physical extent and exquisitely delicate in their expression of the subtle harmonies of gravity. These ringscapes mesmerize with the myriad designs embossed in them — the changing pattern of thick and thin, ruffles that stand as high as the Rocky Mountains, icy waves generated by small moons interacting with the rings, and “streamers” and “mini-jets” created in the ribbon-thin F ring by interactions with Prometheus. The views that have been perhaps the most awe-inspiring are panoramic scenes that encompass the entire Saturn system, including those with the planet and rings backlit, and the tiny glow of our far-off, blue home planet visible far across the gulf of outer space. Cassini carries 12 science instruments to collect a wide range of information about the Saturnian environment. These sophisticated devices take images across the infrared, visible and ultraviolet light spectra, detect dust particles, and characterize Saturn’s plasma environment and magnetosphere. The Cassini-Huygens spacecraft during vibration and thermal testing in 1996. The spacecraft was launched with two elements: the Cassini orbiter and the Huygens probe. Cassini-Huygens reached Saturn and its moons in July 2004, beaming home valuable data that has transformed our understand of the Saturnian system. Huygens entered the murky atmosphere of Titan, Saturn’s biggest moon, and descended via parachute onto its surface – the most distant spacecraft landing to date. Cassini-Huygens is a three-axis stabilized spacecraft equipped for 27 diverse science investigations. The Cassini orbiter has 12 instruments and the Huygens probe had six. Equipped to thoroughly investigate all the important elements that the Saturn system may uncover, many of the instruments have multiple functions. The spacecraft communicates through one high-gain and two-low gain antennas. It is only in the event of a power failure or other such emergency situation, however, that the spacecraft communicates through one of its low-gain antennas. Three Radioisotope Thermoelectric Generators – commonly referred to as RTGs – provide power for the spacecraft, including the instruments, computers, and radio transmitters on board, attitude thrusters, and reaction wheels. In some ways, the Cassini spacecraft has senses better than our own. For example, Cassini can “see” in wavelengths of light and energy that the human eye cannot. The instruments on the spacecraft can “feel” things about magnetic fields and tiny dust particles that no human hand could detect. The science instruments can be classified in a way that can be compared to the way human senses operate. Your eyes and ears are “remote sensing” devices because you can receive information from remote objects without being in direct contact with them. Your senses of touch and taste are “direct sensing” devices. Your nose can be construed as either a remote or direct sensing device. You can certainly smell the apple pie across the room without having your nose in direct contact with it, but the molecules carrying the scent do have to make direct contact with your sinuses. Cassini’s instruments can be classified as remote and microwave remote sensing instruments, and fields and particles instruments – these are all designed to record significant data and take a variety of close-up measurements. The remote sensing instruments on the Cassini Spacecraft can calculate measurements from a great distance. This set includes both optical and microwave sensing instruments including cameras, spectrometers, radar and radio. The fields and particles instruments take “in situ” (on site) direct sensing measurements of the environment around the spacecraft. These instruments measure magnetic fields, mass, electrical charges and densities of atomic particles. They also measure the quantity and composition of dust particles, the strengths of plasma (electrically charged gas), and radio waves. NASA’s Cassini spacecraft will make its final close flyby of Saturn’s haze-enshrouded moon Titan this weekend. The flyby marks the mission’s final opportunity for up-close observations of the lakes and seas of liquid hydrocarbons that spread across the moon’s northern polar region, and the last chance to use its powerful radar to pierce the haze and make detailed images of the surface. Closest approach to Titan is planned for 11:08 p.m. PDT on April 21 (2:08 a.m. EDT April 22). During the encounter, Cassini will pass as close as 608 miles (979 kilometers) above Titan’s surface at a speed of about 13,000 mph (21,000 kph). 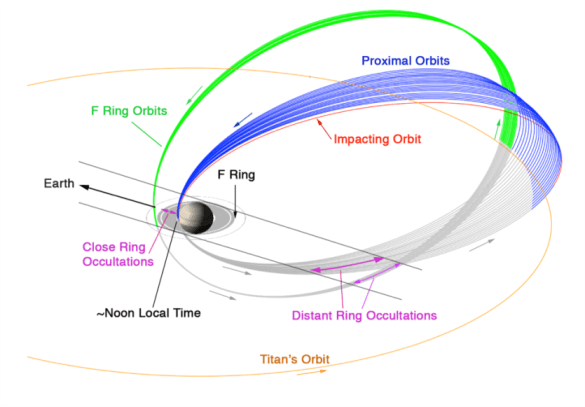 The flyby is also the gateway to Cassini’s Grand Finale — a final set of 22 orbits that pass between the planet and its rings, ending with a plunge into Saturn on Sept. 15 that will end the mission. During the close pass on April 21, Titan’s gravity will bend Cassini’s orbit around Saturn, shrinking it slightly, so that instead of passing just outside the rings, the spacecraft will begin its finale dives which pass just inside the rings. The flyby is Cassini’s 127th targeted encounter with Titan. A targeted flyby is one for which the spacecraft uses its rocket engine or thrusters to accurately aim toward the encounter. Cassini’s radar instrument will look for changes in Titan’s methane lakes and seas, and attempt for the first (and last) time to study the depth and composition of Titan’s smaller lakes. The radar instrument will also search a final time for Titan’s “magic island,” a mysterious feature in one of the moon’s seas that changed in appearance over the course of several flybys. Scientists hope to gain additional insights to help them determine whether the feature is waves, bubbles, floating debris, or something else entirely. Enceladus, one of 62 moons in a confirmed orbit around Saturn, has been in the spotlight since the Cassini spacecraft began orbiting Saturn, weaving among its moons and rings, in 2004. It was only when Cassini turned its instruments toward Enceladus that we learned of the moon’s powerful geysers and subsurface saltwater ocean. This week, scientists made another fascinating announcement about this Saturn moon. They say they now have strong evidence for a habitable area on the floor of Enceladus’ ocean. Their paper on this subject was published in the peer-reviewed journal Science on April 13, 2017. The ocean of Enceladus is covered by a layer of surface ice. The moon’s geysers emerge from the subsurface ocean through cracks in the ice. When the Cassini spacecraft flew through plumes of gas and icy particles that make up Enceladus’ geysers on October 28, 2015, it detected a significant amount of molecular hydrogen. Scientists confirmed this week that the best explanation for this observation is that hydrothermal reactions occurring on Enceladus’ ocean floor. They may be similar to hydrogen-generating interactions taking place at Earth’s hydrothermal vents. 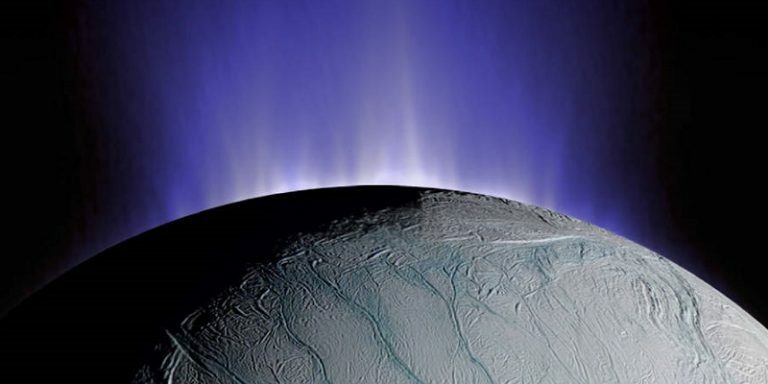 This discovery means the small, icy moon Enceladus might have a source of chemical energy that could be useful for living microbes, if any exist there. Scientists have suggested that water interacts with the rocky core of Enceladus, thereby producing hydrogen. The detection of molecular hydrogen in the plumes of Enceladus supports this idea. Image via NASA. Hydrothermal vents are common on Earth. They are fissures in the ocean crust through which geothermally heated water escapes. In other words, they are regions where water interacts with Earth’s magma. Earthly hydrothermal vents are home to many fascinating bacteria. Yellowstone’s Grand Prismatic Spring is an example of a hydrothermal area with a rich bacterial life. Microbes on Enceladus could produce their energy through a chemical reaction known as methanogenesis, which consists of burning hydrogen and carbon dioxide dissolved in the ocean water to form methane and water. This reaction is at the core of the development of life on Earth. The so-called tiger stripes and geysers of Enceladus, photographed by the Cassini-Huygens probe in October, 2015. Image via NASA. 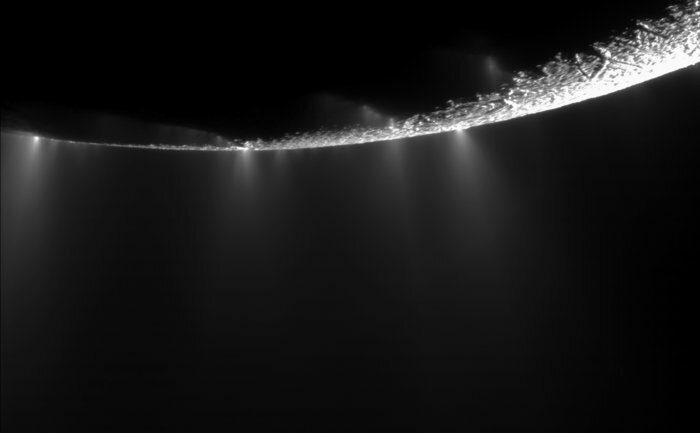 This Cassini image from 2005 shows Enceladus’ geysers – backlit – spewing into space. By flying the craft through the plume from geysers like this one, scientists obtained evidence for molecular hydrogen, possibly produced via hydrothermal processes on the floor on Enceladus’ ocean. Image via NASA. Scientists considered other explanations for Cassini spacecraft’s 2015 detection of molecular hydrogen within Enceladus’ geysers, for example, hydrogen leaking from the moon’s rocky core in ways other than hydrothermal reactions. The scientists who’ve studied these observations most closely, however, now feel that hydrothermal reactions are the best explanation. Liquid water, an energy source, and the right chemicals (carbon, hydrogen, nitrogen, oxygen, phosphorus and sulphur) are the three main requirements for life as we know it. Now scientists discovered all of these life-ingrediants – except phosphorus and sulphur – on Enceladus. The paper published in Science presents a detailed analysis of the possibility of methanogenesis on Enceladus. The calculations are inconclusive as to whether methanogenesis is happening or not around the hydrothermal vents of Enceladus. Nevertheless, this discovery is a big step in characterising the habitability of the ocean of Enceladus. Bottom line: In April, 2017, scientists announced that molecular hydrogen in the plumes of Enceladus, one of Saturn’s moons, may be due to methanogenesis, a process that implies microbial life.